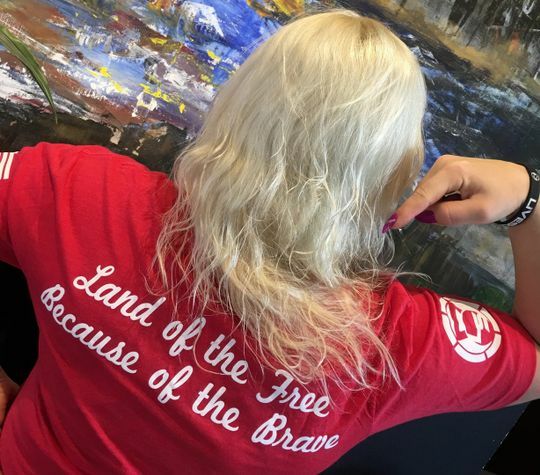 Another awesome design in our Freedom Lines w/ the shirt we call PATRIOT! This awesomeness has an American flag colored bio-hazard design on the front and the incredible saying on the back "LAND OF THE FREE BECAUSE OF THE BRAVE" and the word PATRIOT down the side! You simply cannot go wrong with this badass design and you can wear it with Pride showing off just how Patriotic you are! We have had HUGE SUCCESS with our patriotic designs that we thought it would be a good idea to make this offer readily available at all times. When I placed my order, and live sore sent me a review on what I ordered and I realized that the shirt said small and I ordered a large, I emailed them and they rectified the problem right away and everything I ordered fit perfectly. Thank you very much love sore. Chasity L. Reviewed by Chasity L.
In ❤️️ love with this t-shirt! Thank you so much for the feedback!! Love love love!! You're rockin the shirt in those pictures! Thanks so much!